How to Care for your Soul ~ One step at a time! Right now my mind is screaming one thing and my heart is crying another and my poor Soul is stuck in the middle, wondering which way to go. A soul tug of war. All of these feelings, thoughts and emotions belong to the human self and they race around in our minds competing to get to the finish line first. Yet, that finish line seems to be nowhere in sight. That light at the end of the tunnel has long since gone out. Darkness and depression have set in! How quickly that can occur! As humans we tend to say “yes” when we mean “no” and “no” when we mean “yes”. This is where trouble starts. Our minds are not as good at making sense of things as some people would like us to believe. That’s predominantly because we are looking at the problem using 10% of our brain. We are looking at our situation from a lower-mind perspective, which is a limited point of view. Your mind can only view solutions to problems based on the experiences it has learnt in this life time. Additionally, we are looking at our problems and situations BEFORE the lessons are learnt! No wonder they don’t make sense! That’s when hindsight helps! We can turn hindsight into foresight should we learn from the lessons we experience. Be aware too that should you choose not to learn your lesson at this point in time! It will come back and bite you on the bum bigger than ever! Best to learn each lesson as they are presented because they are presented at exactly the right time for your personal and spiritual growth. Hearts are notoriously untrustworthy too. Much like brains, your heart can only view solutions to problems based on the experiences it has felt in this life time. Your Soul uses up to 30% of available energy to work through and understand problems. It’s when we listen to the Soul that everything makes sense. Your Soul can view problems based on the experiences it has learnt and felt over many life times. This is why it makes sense to view your situation from the Soul’s point of view! When our mind and heart experience dilemma and torment, we try to use our brain or heart’s capacity to understand and come up with solutions to something that can only be understood by the Soul’s superior power. Whenever you feel like this, step out of your human condition for a while and live purely as a Soul. Use the 30% capacity to view your situation. It’s so much easier. It’s here that we can see where our lessons in life are, as well as the lessons of others. Sometimes it is this simple fact that puts us in each other’s lives to start with. Our drama is all just a lesson in this school called Life. Once we see the lessons that need to be learned we can simply get on with learning them or sometimes, even, teaching them in order for problems to be resolved. This only becomes clear when we access the Soul’s capacity to understand a problem. Looking at things from a Soul’s point of view. So…how do we look after our Soul?? Don’t be a People Pleaser. If people can’t look after themselves, why should you! Put yourself first! And on that, People Pleaser’s are actually interfering in other Soul’s journey’s! Did you know that? The universe has orchestrated your life beautifully! You will know this to be true when everything just flows. When everything appears to be going wrong it’s because you are listening to the wrong “Conductor” of your orchestra! ….We just want to love and be loved. It’s as humans that we complicate our lives. Care for your Soul ~ one step at a time! 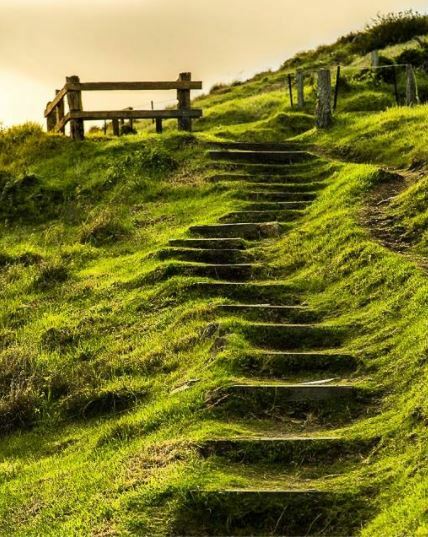 Note to the Reader: If you want to physically climb these steps in person, they are located on the Bluff at Encounter Bay, South Australia! I climb them 4 or 5 times a week. Yes! They are a particularly, hard and steep climb! Very symbolic I think, don’t you!